In a recent Fors Marsh Group (FMG) study, 68% of a nationally representative sample of U.S. adults reported having heard about the Zika virus. 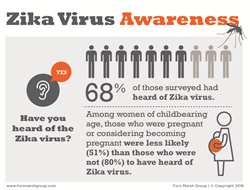 A concerning finding, however, is that among women of childbearing age, those who were pregnant, or considering becoming pregnant were less likely (51%) than those who were not (80%) to have heard of the Zika virus. At the forefront of public health news and outreach is the spread of the Zika virus, a mosquito-transmitted disease that has been linked to microcephaly among newborns. The World Health Organization recently declared the Zika virus a global health emergency as more than 4,000 suspected cases have been documented in Brazil alone since October 2015. In a recent Fors Marsh Group (FMG) study, 68% of a nationally representative sample of U.S. adults reported having heard about the Zika virus. As other sources have reported, awareness of the virus has increased meaningfully since the beginning of the year. 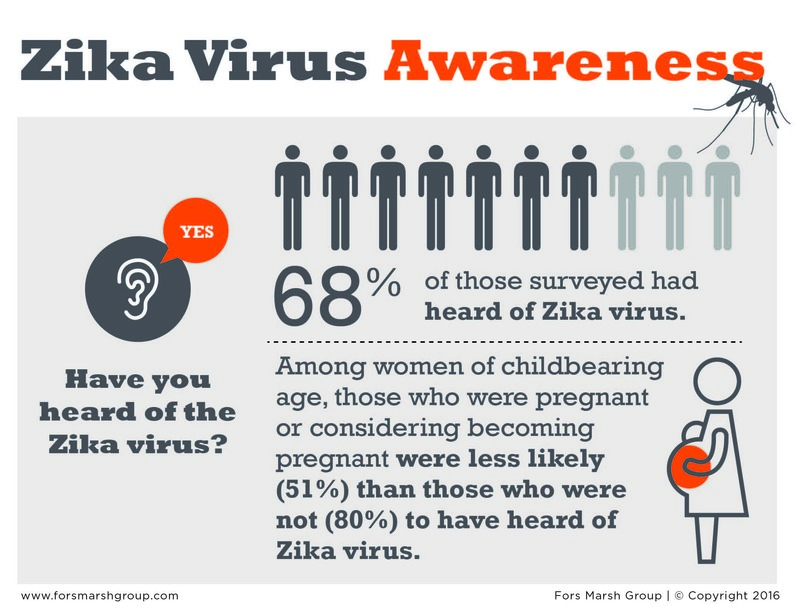 A concerning finding, however, is that among women of childbearing age, those who were pregnant, or considering becoming pregnant were less likely (51%) than those who were not (80%) to have heard of the Zika virus. Of those aware of the Zika virus, 79% reported being at least slightly concerned about the spread of the Zika virus; 36% reported being moderately/extremely concerned. This concern is predictive of behavior: those who were more concerned were also more likely to report being less likely to travel to areas where Zika virus outbreaks have been identified. When considering future travel plans, 60% reported being less likely to travel to areas where Zika virus outbreaks have been identified than they were three months ago. 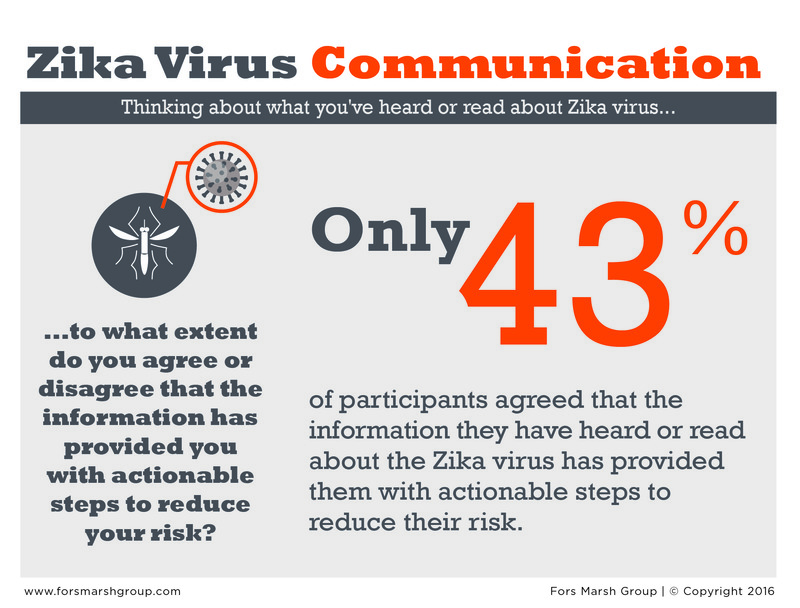 But only 43% of participants agreed that the information they have heard or read about the Zika virus has provided them with actionable steps to reduce their risk. The need for research on how the virus spreads and to what outcomes it is linked is evident. These data, however, point to research needs from a social science perspective—particularly a risk communication perspective—that cannot be overlooked in the meantime. Those at the highest risk cannot afford for us to wait—or guess. Health agencies and practitioners must receive and relay consistent messaging to help educate and influence behavior. To learn more about the health communication research services at Fors Marsh Group, visit https://www.forsmarshgroup.com. Headquartered in Arlington, Va., Fors Marsh Group is an applied research firm dedicated to providing rigorous research and applied communication and strategy consulting. One area of focused expertise lies in health and risk communication. Fors Marsh Group supports private and public sector clients, including government agencies like: Centers for Disease Control and Prevention, Food and Drug Administration, Department of Agriculture, Federal Emergency Management Agency, Department of Defense, Defense Human Resources Activity, Federal Voting Assistance Program, Internal Revenue Service, General Services Administration, Consumer Financial Protection Bureau, National Institute of Standards and Technology, and the Department of Veterans Affairs. This FMG study was conducted via telephone on the SSRS Omnibus. Interviews were conducted February 10–14, 2016, among a nationally representative sample of 1,018 respondents age 18 and older.